So this was an interesting photo taken of a sticker hung in front/near the Capitol reflecting pool in Washington, D.C. 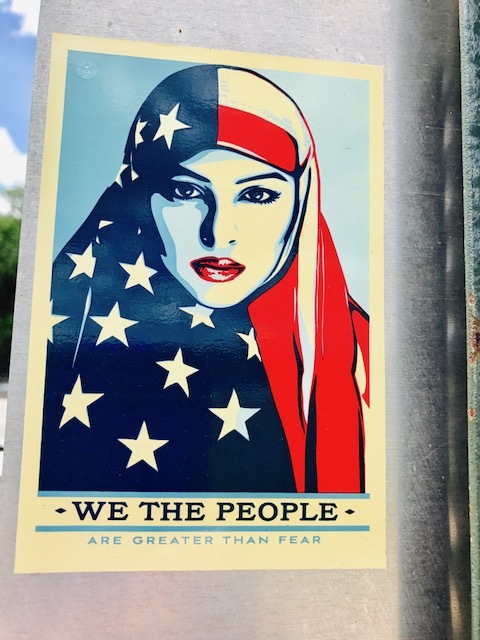 It is one of the faces of the resistance, and while it's not Linda Sarsour, it reminds me of her--she is the one who garnered wide attention at the 2017 Women's March not long ago. Remember her rant of "Sisters and Brothers!" --whose sister is she anyway? With her polarizing politics, support for Sharia Law and anti-Zionist rants and support for the BDS movement, she certainly is not mine. Note: An Israeli official even came out yesterday with like concerns about her. Here are some of Sarsour's alleged sayings about Sharia Law--or is this more of a complete embrace? There is something that feels wrong here. Generic images like the top photo with the traditional Muslim hair covering--again, I respect this. It is overlaid with the American Flag--again nothing wrong with that--Jews wear yarmulkes with the flag too. Hmm...We the people--who is the "we" here? Is this a group photo of Christians, Jews, Muslims, Atheists, etc.--so where is the inclusivity? With Sarsour's insertion of a Sharia ideology into American politics, perhaps, there is a subtle--or not so subtle--attack on our greater American freedom and democracy going on here. - Expropriating other people's causes (such as Democracy and freedom and so called justice with Linda Sarsour). Everyone is entitled to their peaceful beliefs, especially when there is a ethos of mutual respect and a truthful recognition and acceptance for everyone of "Live and let live!" Labels: Dangerous, Demagogues, Diversity, Expropriate, Extremism, Hidden Agendas, Immigration, Iran, ISIS, Live and Let Live, National Security, Photo, Radical Islamists, Respect, Sharia Law, Terrorism, Washington D.C.